Steelers to Open 2010 Season in New Orleans? Heard an interesting rumor yesterday about the Steelers when it comes to their 2010 schedule. The team as we know will play the NFC South this season, and with it they will play the Falcons and Panthers at home, and the Saints and Bucs on the road. So the rumor goes that the Steelers very well may be playing their second straight Thursday night game to start the season, as they may open the season against the NFL Champion Saints. Think about it, the past two Super Bowl champs go at it to start the season – pretty interesting for a nationwide viewing audience. Last season the Steelers opened up the season at home against the Titans, winning in OT 13-10. The report I heard said another possible opener for the Saints may be the team they beat in the NFC Title Game – the Vikings, who they also have on their home schedule. 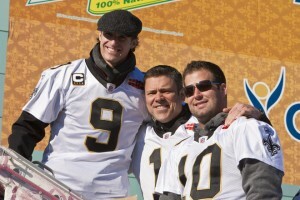 3 Comments on "Steelers to Open 2010 Season in New Orleans?" Doubt it! Why? Grudge match against the Vikings! AFC Vs NFC has NO impact on possible standing for the NFC championship! The loser of a saint Vikes games has Huge ramifications.. It would be HUGE tv ratings, so it does make sense. If Favre is back for the Vikes, that will sway the schedule makers a bit. Personally, I would rather play the Saints later in the season. If only for the reason that after week 10, games gain a bit more in importance and it would be a great measuring stick to face the champs, on the road, late in the season with playoff positions on the line. I realy like your supreme article! Could you write the argumentative essay for example? Because I do know that a professional custom media essays service could compose custom research papers of supreme quality.